Stuffing is mostly bread, and this recipe proves that if you use the best, you'll get the best results. 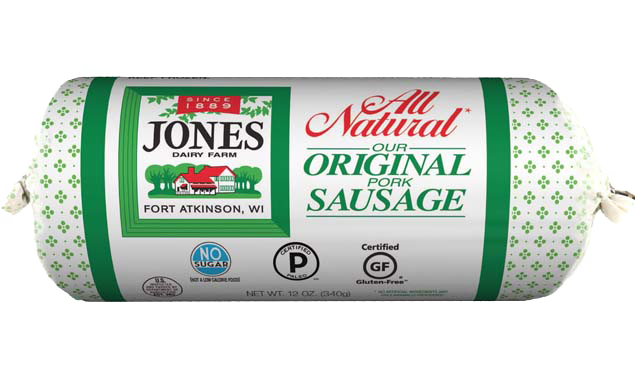 Add Jones sausage and you've got a winner. To make cheddar beer bread, preheat oven to 325°F and grease a 9x9-inch square pan. In large bowl, whisk together almond flour, coconut flour, whey protein powder, baking powder, and garlic powder. Stir in 1 cup cheddar cheese. Add eggs, butter and beer to mixture and stir vigorously until well combined. Spread batter into prepared pan and sprinkle with remaining cheese. Bake 25 to 30 minutes or until bread is golden brown and firm to touch. Remove and let cool about 15 minutes; transfer to wire rack to cool completely. 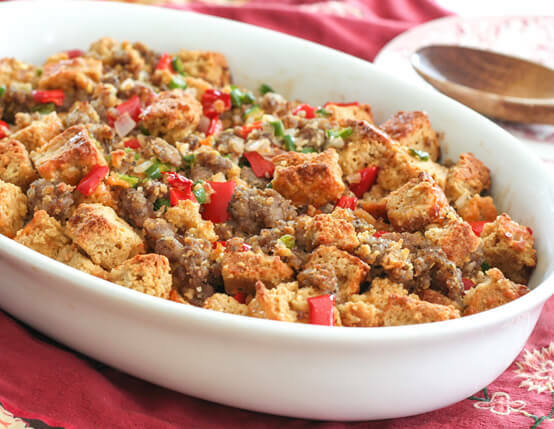 To make stuffing, preheat oven to 200°F and cube bread into ​half-inch pieces. Spread in single layer over large baking sheet and bake 2 to 3 hours, or until browned and dry to touch. Turn off oven and let cool completely inside to continue drying (you can even leave it overnight). Remove bread from oven and preheat to 325°F. Grease 9x13-inch baking dish. Heat butter in large skillet over medium heat. Once melted, add onion and sauté 4 minutes. Add peppers and salt and pepper. Cook until all vegetables are tender, about 5 minutes more. Transfer to large bowl. Add sausage to pan and sauté until just cooked through, about 8 to 10 minutes, breaking up any large chunks with wooden spoon. Transfer to bowl with vegetables. Add dried cubed bread to bowl and stir in broth, tossing to combine. In small bowl, whisk together eggs and cream. Pour over sausage/bread mixture and mix well. Transfer to prepared baking dish and bake 30 minutes, uncovered, until top is crusty and browned. This is DELICIOUS! I have made it several times now. The "bread" is even delicious as is, without making the stuffing. The stuffing is good enough for a meal (we usually eat the leftover stuffing by itself, as a lunch). YUM!